Mock rice made with cauliflower is a great alternative to rice. With 25 calories per 100g of cauliflower compared with 125 calories per 100g of steam white long grain rice, it’s a no brainer that if you are counting calories or looking for a low carb alternative, mock rice is the way forward. Actually, even if you are not dieting it makes a great side dish! I love the flavour and texture of cauliflower rice. You can steam it or sauté it (and you can use your Thermomix for both these processes) but the way I like it is seasoned and roasted in a hot oven for 8-10 minutes at 230C. I add my homemade parsley and garlic oil to the mix for a roasted garlic flavour. 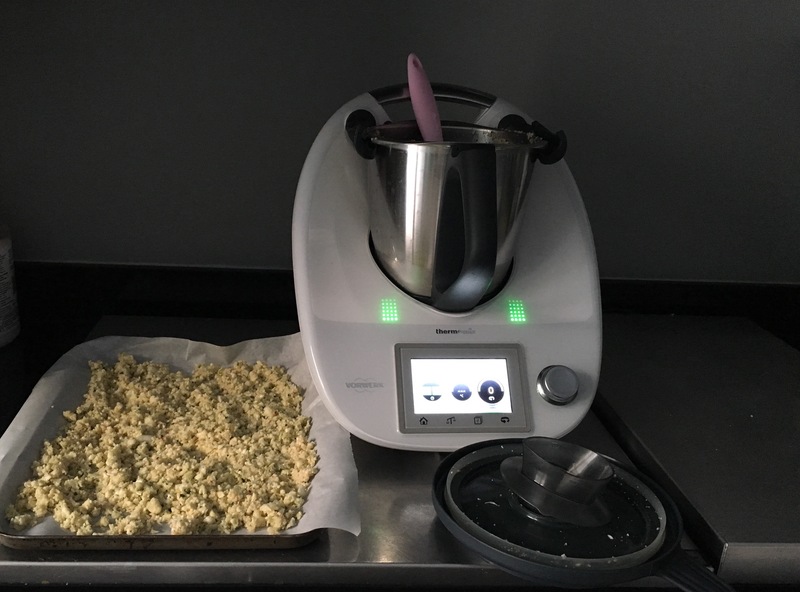 Before I owned a Thermomix I was reluctant to make it only because to prepare it I had to grate the florets which was a time consuming messy job. 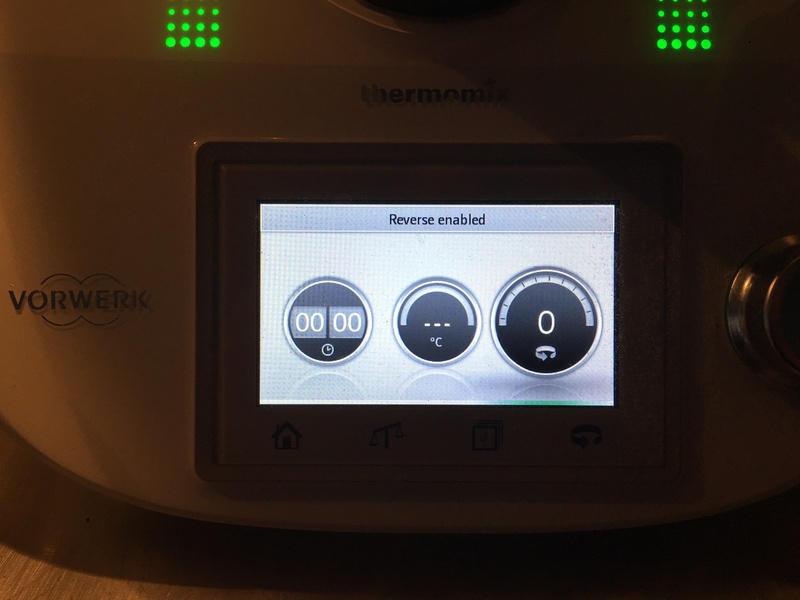 Now, with my Thermomix, it takes a couple of minutes and no mess. 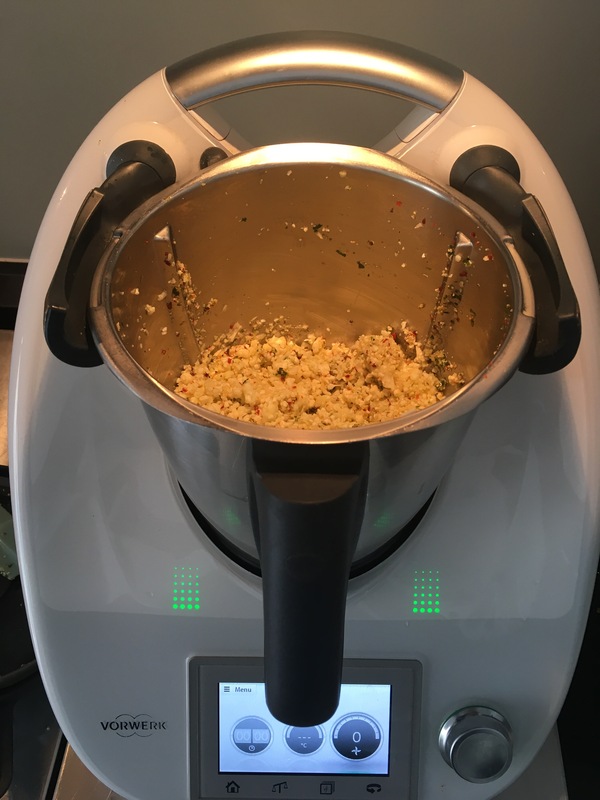 What makes it so easy and effective to make mock rice in the TM5? It’s the blunt side of the amazing blade which is activated by the REVERSE ENABLED function. 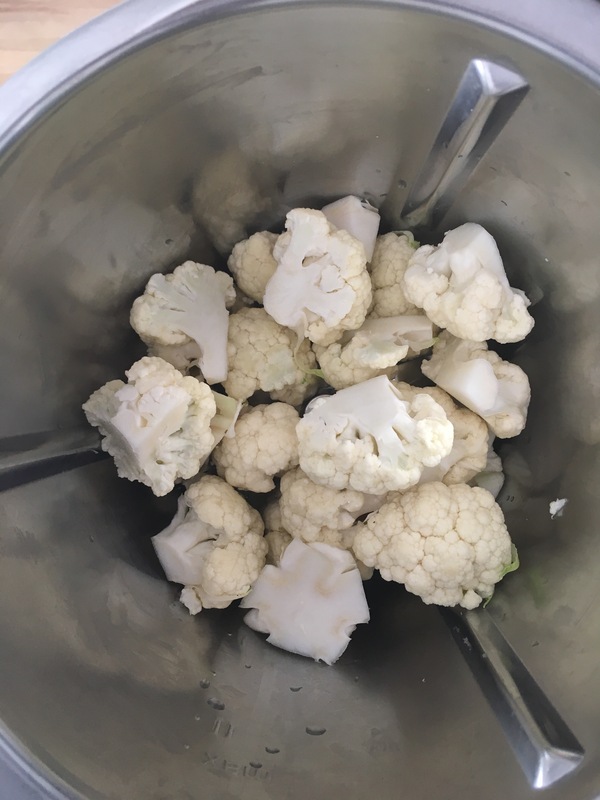 It whacks the cauliflower rather than chops it so it isn’t too fine which is what happens in most other food processors. So do try it! It is delicious. 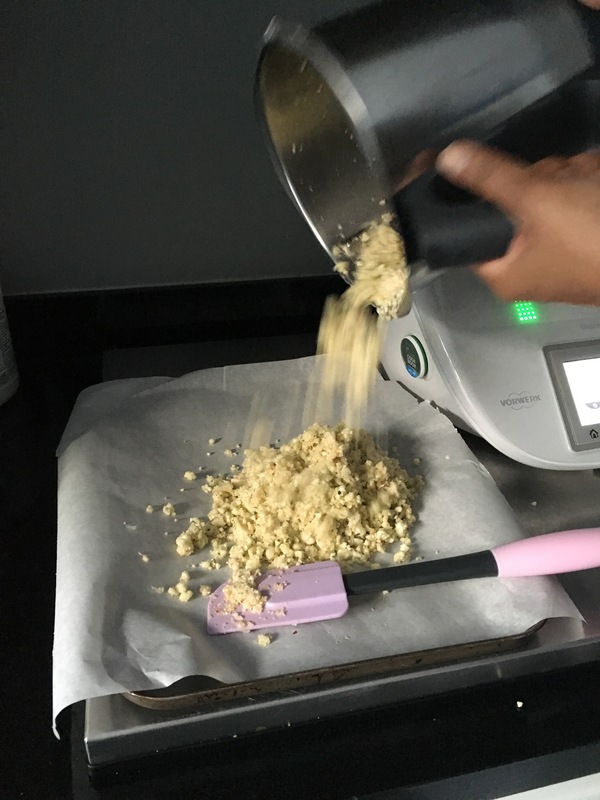 If you don’t own a Thermomix then grate the cauliflower into a large bowl on the course side of your grater – watch your fingers and have your broom ready as it does go everywhere. 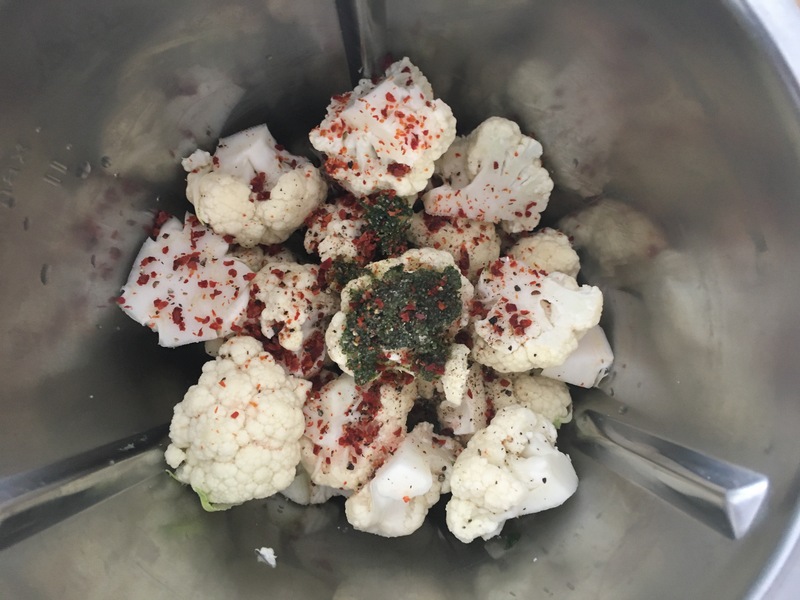 Then add the seasoning and gently blend with a spatula till the cauliflower is well coated. Preheat oven to 230C. Place florets in the TM bowl. With MC on, whack the cauliflower on 5 SECS/ SPEED 5/ REVERSE ENABLED. 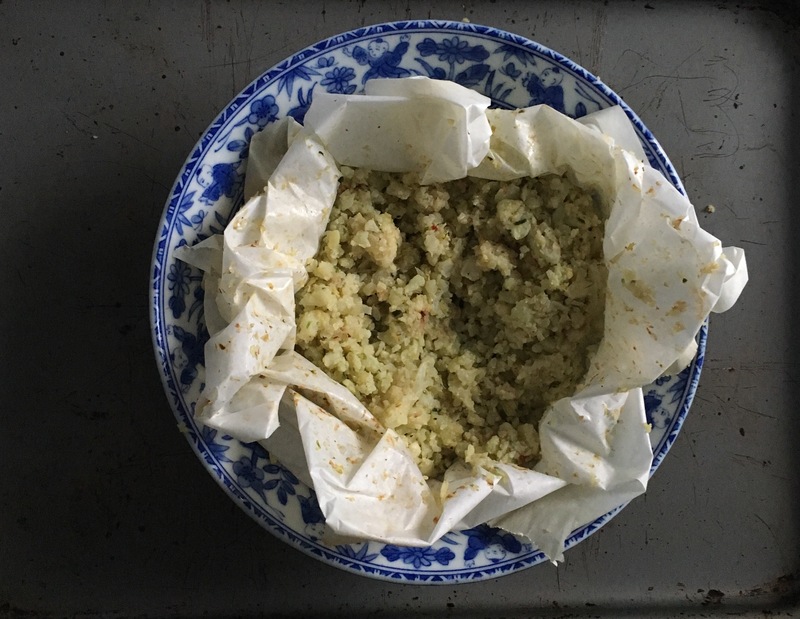 Tip the grated cauliflower onto an oven tray lined with greaseproof paper and spread out thinly. Place the tray in the oven and roast for 8-10 minutes. Serve immediately.